Fruits are now going on sale at the grocer as the growing season is winding down. I have sweet and sour cherry trees in my orchard but damaging storms and birds got more cherries then I did this year so once the price drops down to $1.50 lb. or so I start buying them like crazy to freeze. It’s really nice to be able to pull out a bag of frozen cherries in the winter to add to yogurt or to use in recipes. 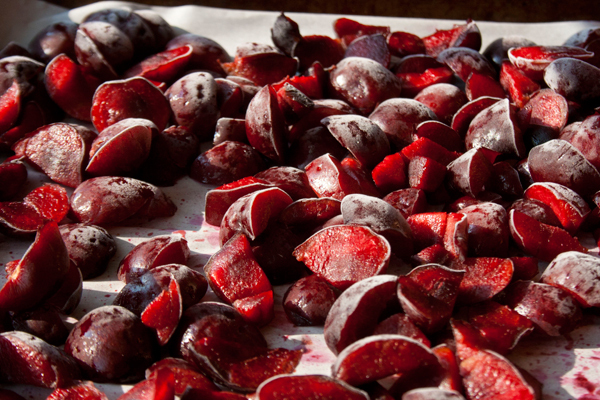 To freeze – wash the cherries, drain and pit. I don’t have a cherry pitter so I just cut up the cherries by hand. It sounds laborious but it’s really not and goes pretty quickly. I’m usually listening to the radio while I’m working in the kitchen so I enjoy the process of harvesting food. Line a cookie sheet with parchment paper as it keeps the fruit from sticking to the pan. De-pit the cherries, spread the cut cherries out in the cookie sheet and pop in the freezer for overnight. No need to cover while they’re freezing. When frozen just scoop them up with a large spoon or spatula, put into a freezer bag or a freezer container and label. When you freeze fruit this way, it doesn’t stick together when frozen so it’s easy to take out exactly how much you need. It may take several batches of freezing depending on how many pounds you buy. The pits and stems can be composted if you have a compost pile going. Between the cows, pig, sheep and chickens on the farm there’s always someone looking for a treat. Miss Piggy the pig, loves fruit so the trimmings go to her. I like that nothing is wasted. 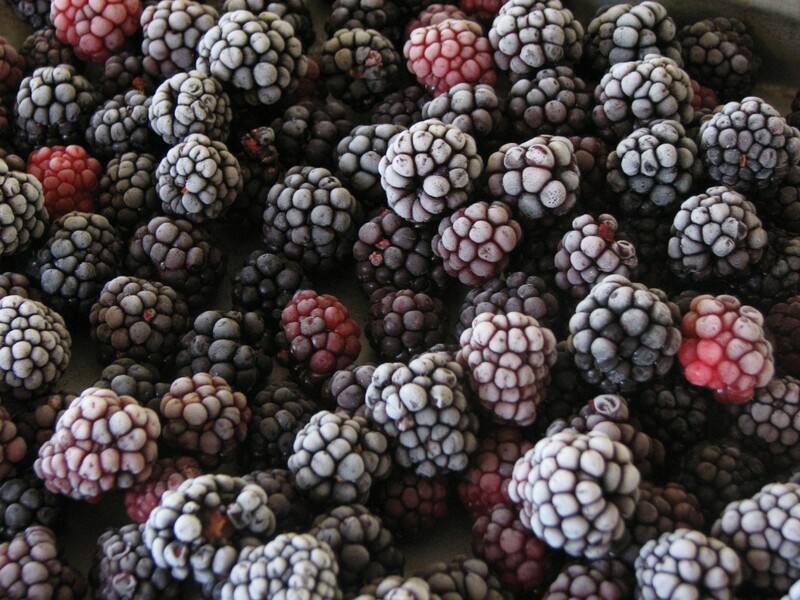 Blackberries can also be frozen in the same manner.